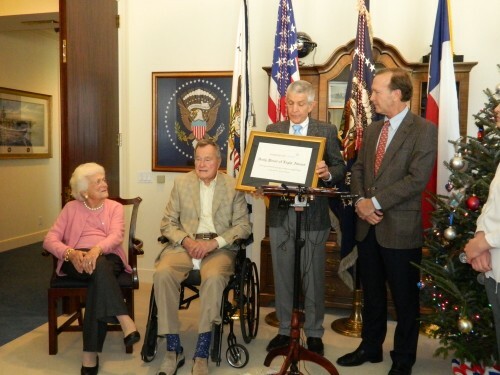 JIM “MATTRESS MACK” McINGVALE receives his Daily Points of Light Award from Neil Bush, right, as Barbara and George Bush look on. Former President Bush nominated McIngvale for this presigious service award. HOUSTON – When George H. W. Bush was in office as president, he initiated an award to private citizens who had demonstrated a high level of public service and philanthropy to his fellow man. He personally gave out over 1000 of these awards, on a daily basis, thus the name. On Monday, Dec. 23, Houston’s own Jim McIngvale was awarded this honor, by Bush’s son Neil Bush, who now heads the board of the Points of Light Foundation. This was the 5115th time the Daily Points of Light Award had been given, but it was the first time that former President Bush had actually nominated the recipient. The award was made at Bush’s office in Houston, with McIngvale’s daughters and son present, as well as Barbara and George Bush, and an interesting touch, the two family dogs, Mini-Me and Bibi. McIngvale was deeply touched by the recognition, and although he and the president, as well as former president Clinton, have been friends for years, he was overwhelmed by the honor. McIngvale’s philanthropy has become legendary, and he spoke about how he was motivated to return to the community many of the profits that he had realized from his Gallery Furniture stores. His charitable work includes donations to heart research, mental health, youth, education, military USO, scholarships at the Rodeo, and needy families throughout the Houston area, especially at Christmas time.